Compatible with all Ariston’s current evo boilers, as well as a Sensys advanced thermostat which comes with the unit, Ariston Net simply requires a ‘Gateway’ device to be installed and connected to a Wi-Fi or GPRS network. The dedicated Ariston Net app can then be downloaded to a compatible tablet or smartphone, enabling real time control through a user-friendly interface. 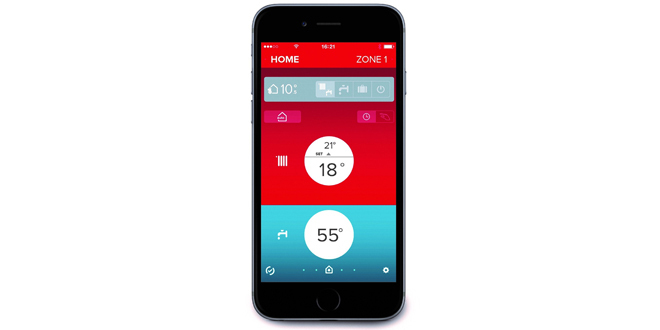 The Ariston Net app offers greater adjustment of the boiler, due to its ability to set the desired temperature in real time, eliminating lengthy waits for the heating and hot water system to warm up. There is also a ‘weekly’ mode that allows bespoke settings to be programmed for each day of the week, via coloured zones which appear on a device’s screen (with white zones representing the preferred high temperature and grey zones the lowest). Ariston will be continuing to develop the functionality and energy saving credentials of the new service, with the company set to add features such as remote diagnostics later in 2016. The Ariston Net app is available through the AppStore and Google Play. Alternatively, additional information can be obtained from Ariston’s customer service team on 0333 240 8777. Ariston Thermo UK, which is part of the Ariston Thermo Group, is a manufacturer of domestic heating, hot water and renewable products. With over 20 years of experience in the UK, Ariston Thermo is a worldwide leading company in the heating and water heating industry. For more details about Ariston and its range of boilers, water heaters and other products, visit: www.ariston.co.uk. For more information on Ariston Net, visit: www.ariston.com/uk/ariston-net. Ariston launches the Aures Slim Multi – an electric instantaneous water heater.